In the Hero’s Journey mythic story structure, the hero hears the “call to adventure” and then makes a choice: she can refuse the call, or she can leap into the adventure. VIDA sounded a call with The Count several years ago, and the impact of their message is still reverberating loud and clear: women are not being equally heard in the cultural conversation. The implication of this fact is the real stunner. If you understand that storytellers shape our culture, then “Who gets to be our storytellers?” becomes a pivotal question. Hedgebrook alumnae in the farmhouse kitchen (clockwise, left to right): Gloria Steinem, Monique Truong, Holly Morris, Carolyn Forché, Suheir Hammad and Ruth Forman (circa 2008). Courtesy of Hedgebrook archives. The question now is: how do we respond? As Executive Director of Hedgebrook, a literary nonprofit whose mission is to support women writers, I am well aware of gender disparity and its impact. I know how many writers in our alumnae community—which includes emerging writers as well as Pulitzer Prize winners, MacArthur Genius Fellows, Grammy and Tony and Obie awardees, Oscar nominees, finalists for the National Book Award and Man Booker Prize, bestselling authors, and celebrated poets—still face challenges getting their work published and produced. As a playwright myself, I’m also aware of how many more plays by my male counterparts are produced each year. According to The League of Professional Theatre Women, less than 20% of the plays staged annually at theatres around the country are by women. (Go to the “50/50 in 2020” Facebook page to join this conversation.) For 17 years, Hedgebrook’s been producing our Women Playwrights Festival, and in that time the statistic has gone from 16% to 17%. One percent in nearly two decades does not count as progress. Which is why the numbers, while egregious, are not shocking. What is shocking is how many people are surprised by VIDA’s Count. Here we are in 2014, still holding onto the false sense that women are closer to having “equal voice” than we are. At Hedgebrook, we’ve found The Count tremendously helpful in making the case that women face more obstacles to getting their voices heard than men. We’re generating a dynamic conversation about what those obstacles are, exploring the story beneath the facts to unearth behaviors and patterns that need to change, both external (sexism, blatant or unconscious) and internal (our own doubts and fears of failure or rejection). VIDA’s Count has inspired Hedgebrook to be bolder in our vision and our message. In 2012, we committed to an expansive new goal to work toward: Equality for women’s voices to achieve a just and peaceful world. This is a major step for a 25-year-old organization that for most of its life has been quietly hosting women writers with “radical hospitality”. Women are used to nurturing others, and supporting their visions, often at the expense of our own. When you turn the tables and give a woman writer space and time to work, and the opportunity to focus on her vision, you send a powerful message: what you have to say matters. The evidence of Hedgebrook’s impact is seen in the ripple effect generated by our 1500 alumnae, whose work is now reaching millions of people around the world. But with VIDA’s call comes the recognition that we need to do more. If we are hosting writers in our cottages who are generating paradigm-shifting work—and who still face prejudicial challenges when bringing that work into the world—then we need to create more avenues, forge connections, and knock down walls to open space for their voices to rise. We are also expanding our programs to include writers who have not yet been to Hedgebrook. Heading into our next 25 years, Hedgebrook is becoming an advocate for all women writers by joining the larger conversation provoked by VIDA’s Count. Gloria Steinem said to me a few years ago, “Women writers need an old boys’ network.” We talked about how women could get better at giving each other a “leg up,” and how a network formed by women might be different, in philosophy and function. How it might look, feel, and act differently. I thought, Of course, this network must already exist. It seemed like a no-brainer. I Googled and asked around, and it turns out, it doesn’t. So we are creating one. Hedgebrook is joining forces with like-minded organizations—VIDA, She Writes, The OpEd Project, Brooklyn’s PowderKeg and others—to bring our collective energy and wisdom to the table, share ideas and resources, and together build a ‘new girls network’ that will expand our reach and effectiveness. Partnering with AROHO (A Room of Her Own Foundation) and The Lark Play Development Center, we are launching the new Shakespeare’s Sister prize, the brainchild of playwright Ellen McLaughlin. Hedgebrook is spearheading the creation of the network by doing what we do: bringing women together, in the spirit of radical hospitality, to discover what our organizations need and can offer each other. From that, we will explore what women writers need from, and can offer, this network. Our conversation is still in its early stages, and you will be hearing more about the network as it coalesces. Spread the word about The Count through your social media channels, via email, over coffee, at work—wherever you are, bring it up. Commit to a personal goal of making at least one submission this year, and enlist a friend (or writer’s group) to help you keep the commitment. Join the movement and Hedgebrook’s conversation by answering the question: “What can I do to support equal voice?” #EqualVoice. 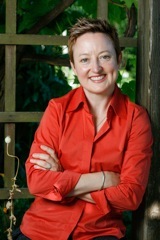 AMY WHEELER is a playwright and Executive Director of Hedgebrook, a literary nonprofit known for supporting the work of visionary women writers whose stories and ideas shape our culture now and for generations to come. Amy’s plays have been produced and developed at theatres and in festivals around the country, and published in Rain City Project’s MANIFESTO series Vols 1 & 2. An alumna of Hedgebrook and Yaddo, Amy holds an MFA from the Iowa Playwrights Workshop. This piece was originally featured on VIDA’s website and can be accessed here.